Pirates of the Caribbean (for real): Anne Bonny and Mary Read | Take Back Halloween! That’s Anne on the left, dressed for shore leave in a combination of stolen finery and sailor slops. Mary on the right is dressed for ship duty—which is to say, her outfit is much closer to what real pirates wore every day. More people have asked for pirate costumes than anything else, and so we had a number of goals with this. We wanted to ground our outfits in authentic sailor garb of the early 18th century, employing period fabrics like striped ticking and blue-and-white check. We wanted to illustrate the real stuff that pirates wore (shoes and stockings, for example), but still find room for the more fanciful items that Hollywood has led us to expect (cavalry boots). And finally, we wanted to come up with believable but cool costumes that wouldn’t just be clones of the Johnny Depp look. Pirates wore a combination of standard-issue sailor slops, plundered loot, stuff they’d sewn themselves, and rags. We provide resource links for all the items in the outfits, but in true pirate spirit we encourage you to use as much scavenged stuff as possible. Old leather belts are great, the more rugged the better. You can transform a man’s modern shirt into something more 18th centuryish by trimming the points off the collar or removing the collar entirely. Capri pants can work as sailor’s breeches, or you can cut the bottoms off a pair of old pants so they’re calf length. Be creative and resourceful. Just like a pirate! 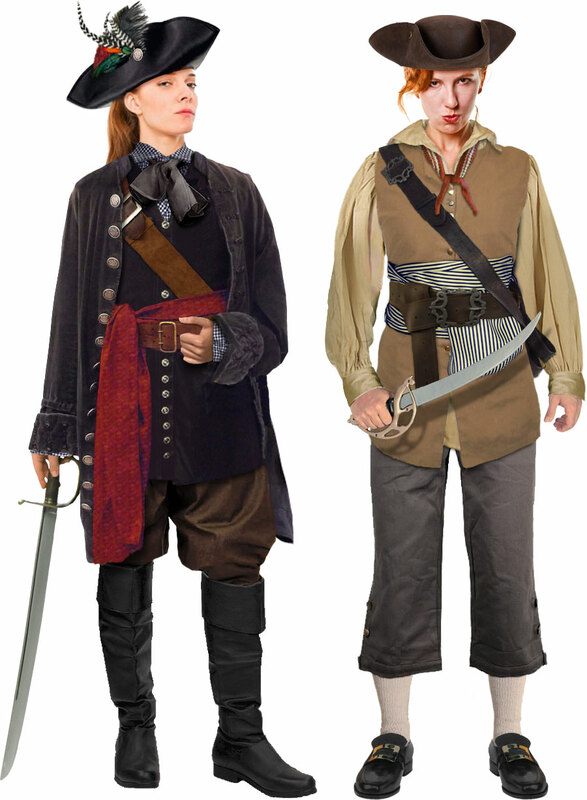 Check it out: Anne Bonny and Mary Read.